Amide the very start of “Peace Talks” between Assad’s regime and “opposition” in Geneva, Switzerland, in which Islamic Sunni militants are not represented, over 60 people, including about 25 Shiite fighters (Hizbullah & Iranians), were killed and over 110 injured, on Sunday 01/31/2016, in twin suicide blasts and a car bomb near Damascus Sayeda Zaynab Shrine in the Shiite South-Eastern suburb of the Syrian capital, on the main road to Damascus International Airport. the interior ministry said. The blasts, one of which was caused by a car bomb the interior ministry added. Sayeda Zaynab was the granddaughter of the Prophet Mohammed the daughter of Ali, the founding father of the Shiaa (Shiaa in Arabic is faction or group) faction in Islam. 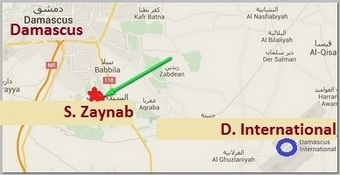 Iran The Lebanese Shiaa movement Hezbollah has cited Sayeda Zaynab Shrine as a key reason that it chose to fight on the side of President Bashar al-Assad. The shrine has been targeted before, including in 02/ 2015 when two suicide attacks killed four people and wounded 13 at a checkpoint nearby. The shrine of Sayyida Zeinab is a destination of mass pilgrimage for Shiite Muslims and a prime target for Sunni militants and their way to be presented in the alleged “Peace Process: in Syria. Sayeda Zaynab is protected directly by the Iranian Revolutionary Guard and the attack is a massive prestigious blow to Iran and its proxy Hizbullah. The Islamic State (ISIS) claimed responsibility for the attack. More than 250,000 people have died and 11 million have fled their homes in almost five years of civil war in Syria. The violence has also been the biggest driver behind Europe’s migration crisis. 09/2015 – DAMASCUS NO LONGER SAFE !